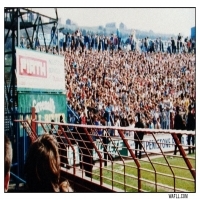 A view here at the travelling Leeds United army from The Terrace the popular home stand at Huddersfield Town's ground Leeds Road. This second division clash coming early in the 1985-86 season. It was an indifferent start to the season for United. Bremners first season in charge for the Whites and up until the Huddersfield encounter at Leeds Road United had won three, drawn four and lost three. The stats didn't improve for the Whites as they went down 3-1 with Ian Baird scoring for Leeds. United went on to finish 14th that season but won the home affair with Huddersfield 2-0 with goals from Ormsby and Snodin. Leeds United: Day, Irwin Phelan, I.Snodin, Linighan, Dickinson, Wright, Sheridan, Baird, Lorimer, Sellars.